Continue without fading. That's one definition of the word "abide". 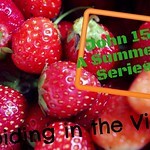 In these July posts, we have been looking at Jesus' words in John 15 where He describes Himself as the vine and us as the branches. Our source of life and all things come from Him. Our response? Abide. There are other places in the Bible where this exhortation is given, but perhaps with different words. Paul tells the Colossians to continue in the faith, grounded and steadfast, and not to be moved away from the gospel of Jesus Christ that they have heard. Over in Philippi, they needed a similar message as Paul told them: "Press toward the goal for the prize of the upward call of God in Christ Jesus." And the author of Hebrews frequently calls out to be diligent, to hold fast the confession of our hope without wavering and to run with endurance the race that is set before us. And yet... in the nitty-gritty of life, I am prone to fade, wilt, give up. How do we continue without fading? How do we abide in Jesus Christ until the end? He is the Rock unchanging. When the temptation comes to waver and despair, we must remain resolute in Him. Step forward in faith, trusting in the King eternal, immortal, invisible, Who alone is wise. Jesus calls to us: "Abide in Me"
so Jesus' joy remains in us and we will be joy-full.